In honour of celebrating Women’s Day this month, here is my very pretty in pink, Pinkberry smoothie, made with antioxidant rich berries, coconut milk, potassium rich banana and of course lots of love. This is a perfect healthy, quick and super easy pre-workout treat, afternoon energy boost or nourishing breakfast solution to healthy living on-the-go. Also great for a girls night in! This one is seriously yummy! Go on…give it a try! 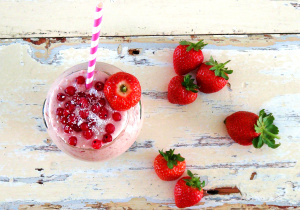 Place frozen bananas, red currants strawberries, and coconut cream into blender/food processor and blend for 1 minute until ingredients are well combined to form a thick smoothie base. Add peanut butter, cinnamon, xylitol, desiccated coconut and vanilla extract to smoothie base and blend further for 30 seconds until all ingredients are well combined. Pour smoothie into glass jar, using a spatula to clean out smoothie residue from blender/food processor. Slice a strawberry through the middle, making sure not to cut all the way through to the top. Place on the side of the glass jar as indicated in the image. Sprinkle with red currants, desiccated coconut and enjoy! Handy Tips: if you have overripe bananas, simply peel skins, cut in half and freeze them in an airtight container to use for a smoothie emergency. Instead of buying new glass jars, collect glass jam jars instead. Soak in hot water to loosen any labels, peel off and use benzene to remove any leftover paper or glue. Wash thoroughly and use to serve smoothies, cocktails, mueslis, cereals, yoghurt, detox water, or chia pudding. You can even use large glass jars for storing deconstructed salads for lunch! This helps prevent salad ingredients from going soggy.